Last Saturday, 19 January, the boys from Voorne M18 played their second game in the 2nd division. After climbing up to the 5th class in the championship. On Saturday, Voorne’s new sponsor gifted the boys with a very nice outfit. The sponsor, IndusClean, enjoys a 30-year reputation as a reliable company with extensive knowledge of thermal, chemical and ultrasonic cleaning techniques for industrial filters and components. Voorne started strong on the attack, but left some holes in their defence, letting through BV Juventus’ offense. After a time-out and a big pep talk, Voorne shored up its defence. Juventus had trouble controlling the ball and Voorne made the most of it. After the first quarter, the score was at 28-12. In the second quarter, we started the full-court press, making it difficult for Juventus to score. That resulted in a half-time score of 49-26! After half-time, we pressed our advantage to the fullest, resulting in a score of 65-47. Many fast breaks were played and played well together. Juventus attempted to make a come-back in the fourth quarter but Voorne did not allow it. 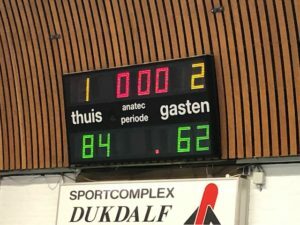 Voorne M18 against BV Juventus (Schiedam) with a score of 84-62. Points: Calvin Phernambucq 33, Niels v / d Merwe 25, Lars Adriaanse 10, Max van Hattem 6, Lanzo Klee 4, Bart Hordijk 2, Benjamin Vlug 2, Hugo Elzinga 2. Furthermore, Bob van Duijne, Maarten v / d Merwe & Midas de Vries. PreviousPrevious post:Upcoming trade fairs for IndusClean 2019NextNext post:INDUSCLEAN IS GROWING!